Updated! Tournament Wild Cards – What Score Should I Aim For? Prior to the College Tournament, I introduced a model for predicting a player’s chances of qualifying as a wild card for the semifinals if they did not win a game. This model took the combinatorics from Keith Williams at The Final Wager back in 2015 but used slightly different percentages. Last updated: December 8, 2018. 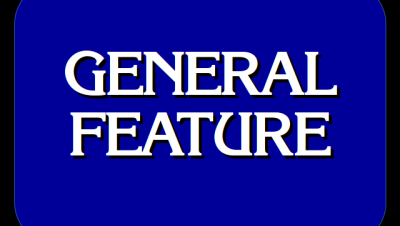 Now includes a model for supertournaments and also includes Season 35 Teen Tournament data. 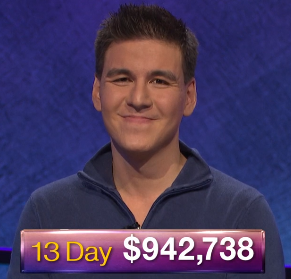 I have now analyzed all four of Jeopardy!’s regular tournaments (Teen, College, Teachers, and the Tournament of Champions). Once the update is fully complete, I will include all tournament quarterfinal scores that I can find; I recently analyzed the difference in Daily Double bets pre- and post-doubling to find that there was not enough of a significant difference to justify not including pre-2001 scores in my model. 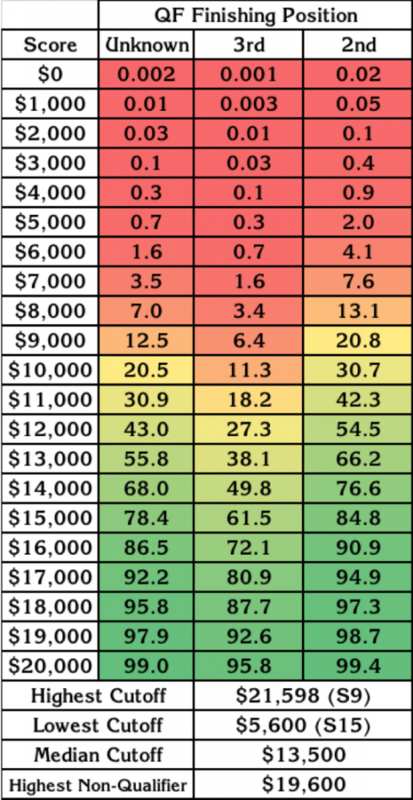 I also have not included the Battle of the Decades and Million Dollar Masters in with the Tournament of Champions data, because I feel that the field quality in the super-tournaments are different enough that I think it would skew the data. Because my update now includes all possible data, I have returned to using a Z-score instead of the Student’s t-score for the College Tournament and the Tournament of Champions. The Teachers Tournament will still use the Student’s t-score in its model for the foreseeable future, due to there having been significantly fewer Teachers Tournaments. Update (August 21, 2018): I have now expanded the model to include supertournaments (of the Million Dollar Masters / Battle of the Decades vein), in a separate model, just in case a future supertournament includes wild cards. 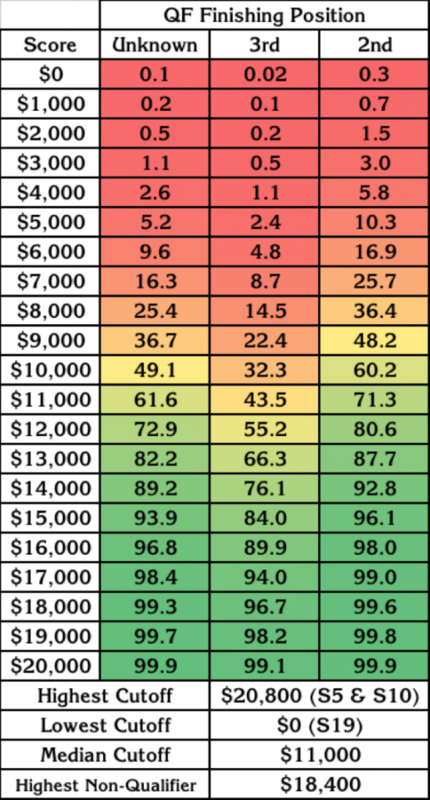 These graphics show the percent chances of qualifying from each position (known and unknown) for each $1,000 score between $0 and $20,000, as well as other pertinent data. 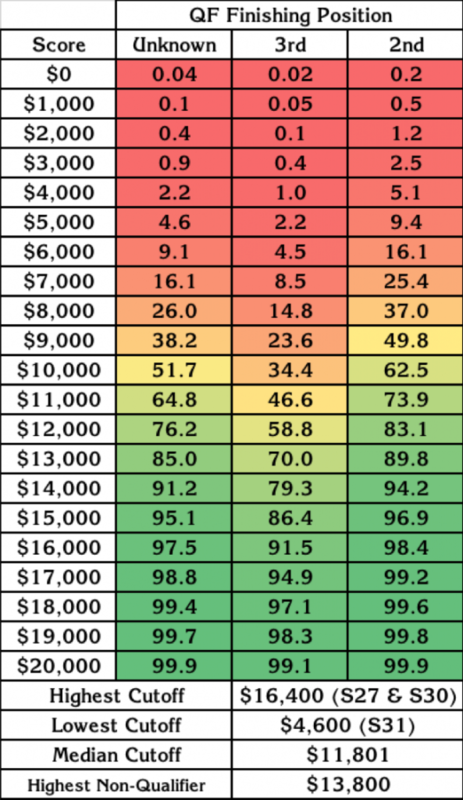 College Championship chances of qualifying as a wild card for each finishing position (known and unknown) and score from $0 to $20,000. Last updated: August 21, 2018. 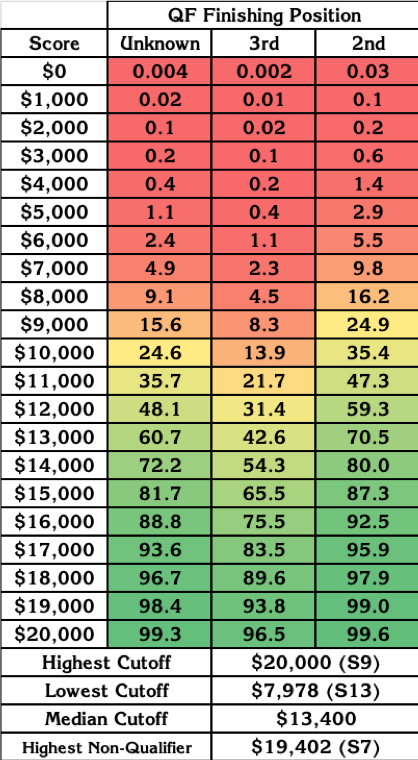 Supertournament chances of qualifying as a wild card for each finishing position (known and unknown) and score from $0 to $25,000. Last updated: August 21, 2018. 1 Comment on "Updated! Tournament Wild Cards – What Score Should I Aim For?" A huge thank-you to Robert Mcielwain, whose late 80s and early 90s data was invaluable in completing the set of College Championship data.